Aspirin Placed Next to a Tooth Helps a Toothache? 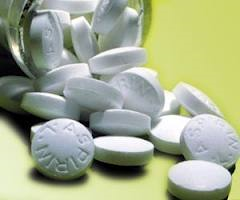 Swallowing aspirin will help reduce toothache pain. Since aspirin is acidic, placing it beside the tooth can actually burn your gum tissue, causing an abscess. A toothache is simply known as any varying level of pain in your teeth or jaw areas. This can be caused by a number of reasons, from injury to gum disease, but the most common one is tooth decay. One of the simplest types of decay is a cavity, and depending on the degree of the cavity, the pain can become agonizing. It is very common and may occur at any time, so many people turn to natural and home remedies for a toothache. How Can I Prevent a Toothache From Occurring? The most common reason for a toothache due to tooth decay is excess sugar intake. This might be from a bad diet or even too many sodas. The most effective way to prevent cavities and other tooth decay is to eat healthier. By eating an apple instead of that last piece of chocolate cake, you are choosing between natural ingredients that help strengthen your teeth and processed sugars that will only add to your risk of cavity. Another way to help prevent tooth decay is by increasing your Vitamin C and Calcium intake, which can strengthen your teeth. One way to get Vitamin C is through eating limes. Brushing your teeth twice a day also helps to remove any plaque that might have built up before it turns into a cavity. Home remedies are great ways to quickly alleviate tooth pain, but they do not cure the problem. The only way to fully diagnose and solve the issue is by going to your dentist to have an oral examination with an X-ray. The dentist is then able to tell you why your tooth is hurting and how you can treat it.